Deep cleans hidden grease & limescale. Day after day, grease and limescale build up in your dishwasher filter, spray-arms and pipes. 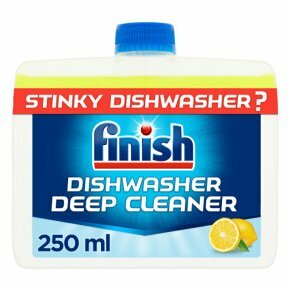 Get 100% better cleaning* for your dishwasher with Finish Dishwasher Cleaner. *At least 2x more removal of limescale and grease from your dishwasher vs cleaning your machine using: (i) water alone; or (ii) Finish All In One detergent alone. DANGER<br>TRIDECETH-3<br><br>FINISH Dishwasher Cleaner Lemon Sparkle. Contains Trideceth-3. Causes serious eye damage. Causes skin irritation. Keep out of reach of children. IF IN EYES: Rinse cautiously with water for several minutes. Remove contact lenses if present and easy to do. Continue rinsing. Immediately call a doctor. IF ON SKIN: Wash with plenty of soap and water. If medical advice is needed, have product container or label at hand.